Vancouver Mom > Neighbourhoods > Fraser Valley > 6 awesome things to do in Surrey with kids! The City of Surrey covers a lot of land, but don’t let its vast sprawl intimidate you. There’s a lot to eat and do, if you know where to look! This free museum Surrey is a hit with adults and kids alike! From prehistoric dinosaurs to a quirky show and share case curated by members of the community, the museum has something for everyone. There’s even an explore zone (by TD) so the little ones can blow of some steam on the giant slide while exploring a mini-Surrey divided by river, forest, wetlands, agriculture, urban and ocean. And yes there’s the parenting trifecta too: seating, free WiFi and a place to charge your phone, and a cafe! PS: When you’re done, visit the railway across the street. This place is odd, at first. It’s a nursery, and you can buy everything you need for your garden there. They sell Crocs, but, like, a lot of them. You can also buy women’s clothing (fleece lined leggings! ), choose from a massive selection of interesting hot sauces, poke through their collection of British groceries and candies. Play a round of mini golf, or take a mini train ride on Thomas the Tank Engine, and if it’s close to Christmas or Halloween, be sure to peruse their unusual and wonderful selection of holiday décor. They often have farm fresh chicken or duck eggs – ask the cashier if any are available. Take a tour of this working honey farm (public tours on Saturdays, Sundays and stat holidays), or participate in a live beekeeping demo. Observe bees in action in the Observation Hive, and choose from a selection of local honey in store. Highly recommended? The buckwheat honey makes a beautiful sweetener for rich, spicy baked goods; the orange blossom honey is loved by locals and chefs alike. Grab coffee and panini while the kids work out their energy at this family friendly café designed for parents with little kids. The play area is best for children under 5, and costs about four dollars per child. They are a nut-free facility, and offer gluten-free and other allergen-friendly snacks and treats, as well as organic baby food and small-person snacks like yogurt, veggies and dip, and fruit snacks. Free wifi. Got a little one who CAN’T. GET. ENOUGH. TRAINS? The Fraser Valley Heritage Railway Society runs antique electric trains between Cloverdale and Sullivan Heights from May 4th through October on Saturdays and Sundays only. The full trip is a little under an hour, and will cost $10 per adult or $5 per child 12 and under (round-trip). The ride starts and ends at Cloverdale Station, where there’s free parking available. Call ahead to make reservations. PS: Check out the new Widlflower meadow while you’re there! 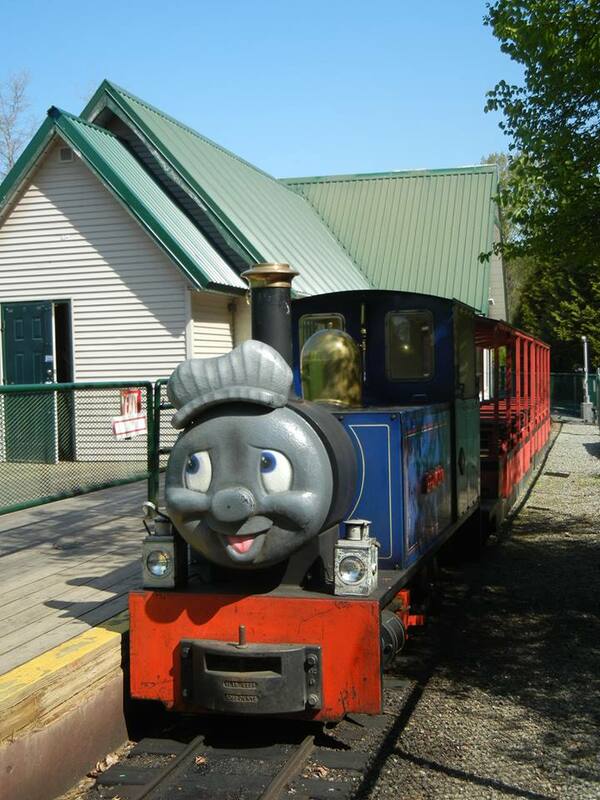 This family friendly park is famous for its adorable train Eddy the Engine that gets its gears on for holidays including Halloween, Christmas, Valentine’s Day, Easter and of course summer vacation. But did you know that the park itself is a sprawling 152 acres of natural beauty? Along with the train, there’s mini golf (18 holes! ), a playground, summer water park and outdoor pool, covered picnic tables, walking trails, a walking oval and exercise circuit and the Bear Creek Gardens. My husband and I volunteer at the Surrey Heritage Railway and thoroughly enjoy the experience. The kids just love the ride. Come on out, the season starts in May until early October. Had a marvelous response to our Halloween train this year. Hi Emily! Don’t forget the Surrey Museum’s new hands-on Kids Gallery. It explores sustainability from a kid’s point of view. And we’re free! It would be fun to combine a visit to the railway then come across the street to the Museum. We reopen on Feb 9. Join us! Art Knapps is so great, my kids just love it there — and they always have holiday themed things going on. Walking around the bird sanctuary next to it is beautiful as well.